Celebrate your New Year with a bang with this Dynamite Cheese Sticks, Expect each bite to be bursting with strong flavors of Mexican-inspired beef, creamy cheese, and spicy finger chilies all in one roll. 1. Heat oil in pan. Sauté onion and garlic. Add ground beef and taco seasoning. Season with salt and pepper to taste. Cook for 10 to 15 minutes. Set aside. 2. Wash the chilis. 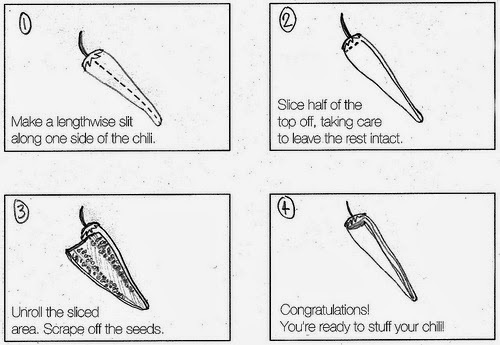 Cut them longitudinally, like creating a slit from the cap of the chili and near its tip. Remove the insides of the chili (the seeds and the white stuff). It looks quite presentable if you don't cut the stalk. 3. Stuff each chili with your cooked ground beef and a strip of cheese. Wrap your stuffed chilis with your lumpia wraps as you would a spring roll or shanghai. 4. Deep fry your chili rolls in medium heat in a cooking pan for 5-7 minutes or until the wraps turn into a golden brown. Serve hot.